Toyota Motor Corp and SoftBank Group Corp said they would team up to develop new transport services, adding to a slew of deals aimed at sharing costs and securing expertise in technologies which promise to drastically change the way people use cars. The partnership between Japan's top automaker and tech firm shows that even the biggest, well-funded players fear being left behind in the race to develop self-driving and connected cars. The companies said in a statement they will form a new joint venture would be called MONET, short for mobility network, that will start with 2 billion yen ($17.5 million) in capital. SoftBank will hold a 50.25 percent stake with Toyota owning the rest. The news comes a day after Honda Motor Co Ltd said it would invest $2.75 billion and take a 5.7 percent stake in General Motors Co's Cruise self-driving vehicle unit, in which SoftBank is also an investor. Also on Wednesday, Daimler AG and Renault said they may expand their cooperation to batteries, self-driving vehicles and mobility services. 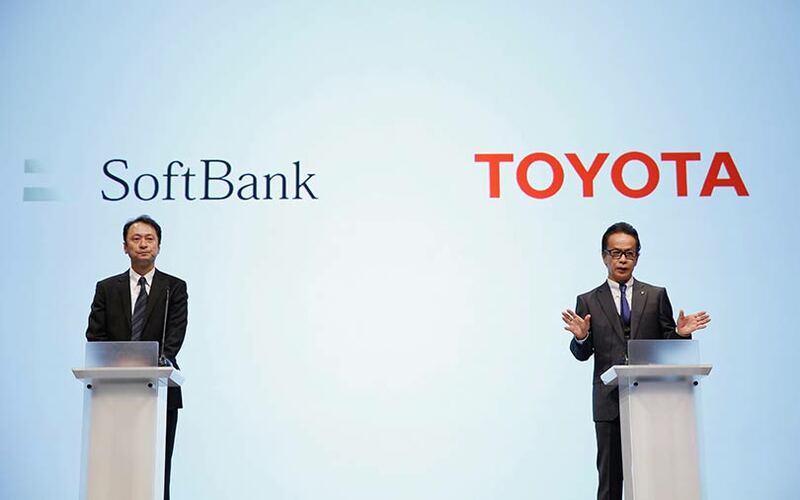 Toyota and SoftBank do not have any major partnerships in mobility technologies at the moment, although both are developing technologies for self-driving vehicles, car sharing and other services. Both have investments and partnerships with Uber Technologies and ride-hailing firm Grab, and Didi Chuxing. Toyota, one of the world's largest automakers, has been developing automated driving and artificial intelligence technologies in-house and with its group suppliers, while acquiring some technology start-ups. The automaker envisions the future of transportation services will include convoys of shuttle bus-sized, self-driving multi-purpose vehicles used, for instance, as pay-per-use mobile restaurants and hotels. At the start of the year it said it was developing a service called "e-Palette" based on this concept. Amazon.com Inc, Didi, Uber and Pizza Hut are early partners in the project, and Toyota has said it plans to use e-Palette vehicles to ship athletes and guests around during the 2020 Tokyo Olympics.